Well...I've heard that the camera does add 15 pounds, but this is ridiculous!!! I think this might be a candidate for gastric bypass! Though it is rather cute. They're not supposed to be this big in captivity, but their penchant for food makes it rather difficult to control their weight...I read that it was something like 90% of pet pigs are overweight, even when fed proper portions, because they are smart enough to find their own food and gobble it down! My husband's parents have 2 pot belly pigs. The first one they got was as big as that, but has since slimmed up some. The other they got from a friend who couldn't take her pet w/ her when she moved. That one was never as big as the other. That pig is grossly overweight. It will die years before it should. That pig is still very young, and it is overweight for it's size. 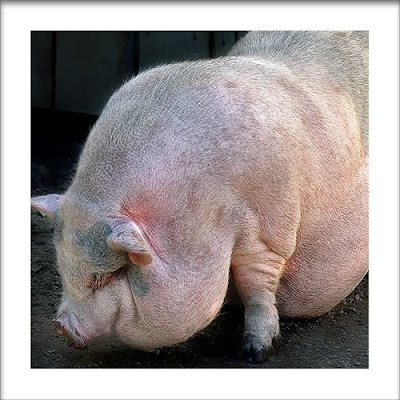 However, contrary to the falsities perpetrated by backyard breeders, healthy pot-bellied pigs should be 100-250 lbs. at full maturity, and about the size/girth of a large breed dog (such as a labrador). Pigs take about 5 years to reach full maturity, but are able to breed and produce litters at just a few months of age.